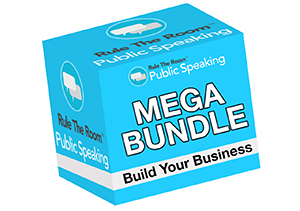 Build Your Business Mega Bundle - Presentation Skills Training - Online Public Speaking Courses | Rule the Room Today! What is the Build Your Business Bundle? …this recipe has been tested with real prospects and customers. …you’ll also get to see me model how to create urgency and increase value with customers at all five of the most common money-making presentation situations you will face. There’s all meat and no fluff. If you want backstory and theory, go read a blog post. The Build Your Business Bundle is all about taking action and getting results as quickly and easily as possible. This bundle of 8 programs is 16+ hours of video training, so if you are working at it full-time you could technically complete the class in two days (although this is not recommended). To fully understand and apply the materials, you should allow 4-8 days if you are working full-time, and 14-20 days if you are taking the classes part-time. When do I have to finish the Build Your Business Bundle programs? It’s totally up to you. You can go at whatever pace suits you best! You’ve got a lot of other things going on in your life, so just because you enroll in the Build Your Business training doesn’t mean you need to complete it right away. In fact, you can start and finish whenever you want. Either way, we’re going to be there with you every step of the way to ensure you’re successful. How long can I keep the Build Your Business Bundle programs? Do you offer grants or financial aid for your Build Your Business Bundle? "It's the most effective presentation on how to deliver a effective presentation ever. I've applied the techniques of small talk in recent networking seminar recently, turned out to be very successfuly. I am preparing a group presentation for all states all April in Australia, I am looking forward to applying all relevant tenichiques to tailor my presentations and make my audience benefit and love it. I am super excited. Having gained the knowledge of how to deliver a effective presentation, it has removed my nervous feeling away. I would like to subscribe more courses from Jason for further skills upwards. This is just fascinating!" does not hit a customer's hot button I have wasted their time. 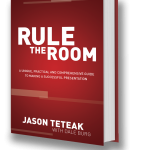 I am interested in helping people achieve results—Rule the Room has provided the tools to make this happen. "Showing credibility, building rapport, and captivating audiences are important in presentations, but even more important for an entrepreneur, they're critical in sales. And let's face it- when you're an entrepreneur, you're always selling. If you're going to convince a new customer to purchase your product, you have to do all three effectively. Whether you're in front of room of 100, or just talking one-one-one, it's important to pay attention to each of these elements to convert the prospect into a customer." ”Every piece of advice you give has a very clear, direct follow-up action: if you want to get better at x (and by the way, doing x makes your presentations better), do y. The "y" you specify is never vague but instead very precise and obvious, thereby making your advice practical, unlike most given on the topic.